It has been a troubling year for the Iowa football program. Since spring practice ended in 2007 more than a dozen Hawkeye players have been arrested and several are no longer with the team. It was also a difficult season on the field for the Hawks and they enter spring drills looking to bounce back from a six-and-six record that kept them home during the bowl season. Iowa coach Kirk Ferentz says he’s tired of using the word “disappointing” and says the program is working to stop the off-field incidents. Ferentz says he always tells recruits they will go through three transitions, football, social life and academics. He says the football aspect is probably the easiest, as there’s a peer group in place to help out. 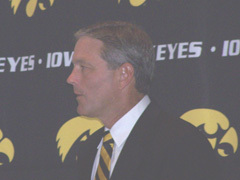 Ferentz says anyone who went to college probably knows the social aspect is a tougher transition. Ferentz says as hard as they will try it is impossible to guarantee that no players will get into trouble. He says he really struggles with the repeat mistakes, as he says if you do something wrong twice you are not learning and are showing you have a problem, don’t care or are too dumb to get it. Ferentz says they can work with guys on the first one, but it’s tougher in the other two cases. Ferentz admits their image of the program has been damaged. “We’ve brought that upon ourselves, you know we’ve created a situation right now, it’s kind of like having a losing season or non-bowl season,” Ferentz says. He says there’s going to be a public perception of the program created by the problems,”You have to live with it and you have work toward finding solutions and correct it.” Ferentz says the staff and players have to be accountable and they’re not going to be successful in any regard if they can’t do that. Ferentz announced that one of the players that got into trouble has decided to transfer. Wide receiver Anthony Bowman pleaded guilty to credit card theft along with fellow receiver Dominique Douglas and both players were suspended for last season. Andy Brodell returns after missing much of last season due to injury and Ferentz says that will bolster the receiving corps. Ferentz says the only good think about the injuries, is that other players got some experience. The running back spot is a concern. Albert Young and Damien Sims are graduating and one of those competing for the job will be Shonn Greene, who will return after spending the past year in junior college. Ferentz says they will have to get contributions from some young players and Greene still has some work to do.